Time series of geostrophic transport of both the northwestward flow (blue) and the retroflected flow (red) of the North Brazil Current (NBC). The transport is estimated across transect #1 ( see map ) using a combination of sea height anomaly (SHA) fields from satellite altimetry (AVISO) and climatological data (Levitus). This time series of geostrophic transport anomaly of the NBC retroflected flow is produced using sea height anomaly fields from AVISO. The time series of geostrophic transport of the NBC retroflected flow is also estimated across the transect defined by IES17 and IES14 locations ( see map ). A combination of sea height anomaly (SHA) fields from satellite altimetry (AVISO) and climatological data (Levitus) are used to estimate the geostrophic transport. 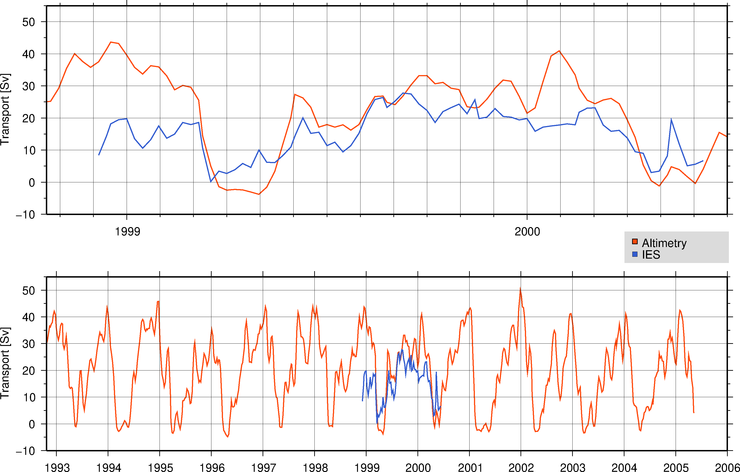 These results are compared to the time series obtained using a combination of IES and CTD data during the NBC Ring Experiment. Last updated on 02/28/19 02:20.